It's Easter, Easter, Easter, Eostar. Nothing to do with a man dying on a cross and returning to life in three days, but the remnants of the Pagan Spring Equinox when the elements of life are being brought into a new balance, psychically, as day and night attain equal length. Light is gaining for future days will now be longer than nights. So a new tide of life begins. 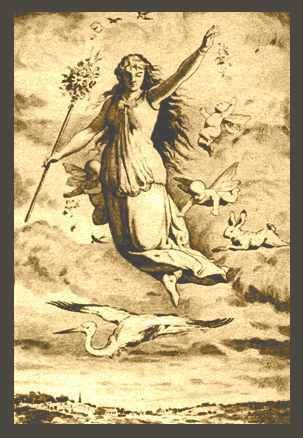 Therefore, the main spring-equinox or Eostar symbol is an egg, which symbolizes fertility in nature. Yes, the Gaia, the Mother Earth's special day. Eggs, perhaps hardboiled and hand-painted, show the emergence of life from darkness. They are the Goddess fertile, rich with promise and potential life. Named for the ancient Teutonic Goddess Oestre, whose name connects with the root of our modern world oestrogen, the hormone stimulating ovulation. Breaking through and breaking out. Spring Queen dances through the land. Spring blooms, throughout and about.